You should choose this course if you want to learn how to respond in the event of a fire or of hearing a fire alarm. Fire Awareness Training is a legal requirement for all staff under the Regulatory Reform (Fire Safety) Order 2005 and current HSE regulations. This course covers basic fire safety, including evacuations, the use of extinguishers and legal responsibilities. A fire, or similar emergency can happen at any time in your workplace. This three-hour course will ensure that your staff and their managers all know what to do to maximize safety in the event of a fire or a gas leak. This training is designed both to protect your team and fulfill your legal obligations under relevant health and safety and fire laws. Is the Three-hour Fire Awareness Training right for me? This is one of the few training courses that applies to everyone in the workplace, including casual and temporary staff, plus any external companies or contractors that are active in your work environment. The course is important for your team and your company, since the law states that, as an employer, you must ‘ensure that your employees are provided with adequate safety training’. Put simply, this course could save your life. In just three hours, you can learn how to respond positively and proactively in an emergency situation, making the right decisions that will protect yourself, your colleagues and company property. 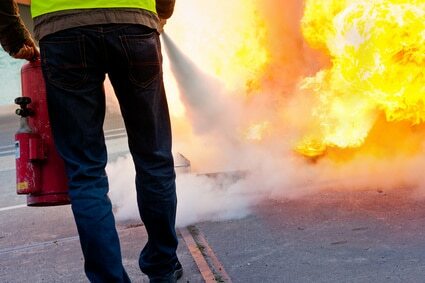 Where possible, we will deliver practical training in the use of your organisation’s fire extinguishers and other fire fighting equipment, with live demonstrations possible by prior arrangement. Fire Awareness Training takes just three hours, and can be arranged at your convenience to fit in with staff schedules and shift patterns. You will be continually assessed throughout the training to make sure that you have understood both the principles being taught and their practical application in your own workplace. At the end of the course, you will undertake a Fire Risk Assessment project to demonstrate your understanding. You will not receive formal certification for this course, since fire safety is the responsibility of your employer. Where is the Three-hour Fire Awareness Trainingheld? Since fire safety applies to everyone in the workplace, Fire Awareness Training is normally done in-house to allow everyone to attend. In-house training makes the course more practical and relevant, as we will be able to tailor the training to the actual equipment and evacuation procedures of the buildings in which they work. In-house training is more convenient, covering the whole team in one session, more cost-effective, as there are no travel costs, and more efficient, as your staff will only be away from their jobs for the three-hours of the course. We are confident that we can offer you a competitive price for convenient, tailored fire safety training. Talk to our friendly team today on 00808 164 9690 and see how we can help you take better care of your team.